Did you have any of these stars in your Official Fantasy Bundesliga team on Matchday 17? The Bundesliga is back and the first Official Fantasy Bundesliga points of 2017 have been handed out! Click here to check your Official Fantasy Bundesliga team's tally after Matchday 17! With Timo Horn still recovering from injury, Thomas Kessler has used the opportunity to prove his worth between the Köln posts. Kessler made a string of top saves to prevent 1. FSV Mainz 05 from scoring at home for the first time this season and was duly rewarded with his first double-digit tally of the season. 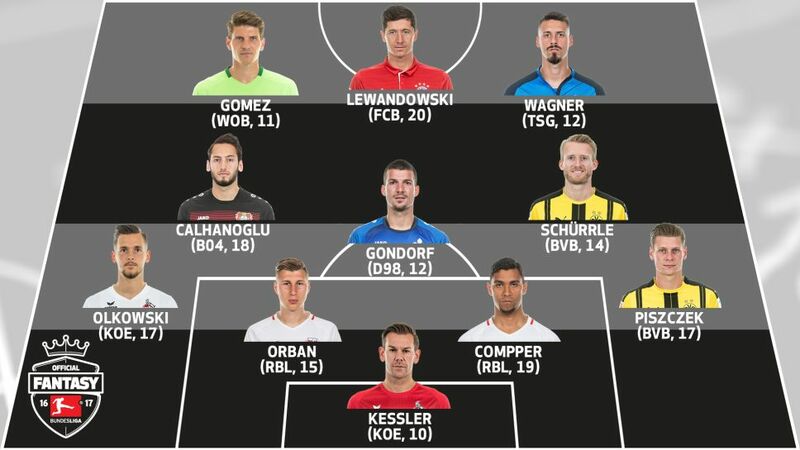 Scoring a 72nd minute winner against SV Werder Bremen, Lukasz Piszczek secured his place in the Team of the Week for the second time this season. His goal against 10-man Bremen brought the Polish international to a career-high four goals in 17 matches. Marvin Compper became Leipzig's oldest Bundesliga goalscorer with his first goal in the top flight since May 2012 in the 3-0 win over Eintracht Frankfurt. The 31-year-old also picked up as many points - six - for duels won. In his fourth appearance in the Official Fantasy Bundesliga team this season, Leipzig's captain led from the back on Saturday evening. Winning 79 per cent of his duels, the highest of any player on the pitch, Willi Orban ensured Leipzig kept their eighth clean sheet of the campaign. With a season-high 17 points, Pawel Olkowski won an impressive 20 challenges to keep 1. FC Köln at bay on Sunday evening, and all for just 5.25M! With his first ever brace in a Bayer 04 Leverkusen shirt, Hakan Calhanoglu notched up a total of 18 points this week. The Turkish midfielder was a defender's nightmare on Sunday afternoon, providing the most shots and most crosses of any player on the field. The 28-year-old Darmstadt midfield engine put in the miles in the bottom club's goalless draw against Borussia Mönchengladbach. His 20 completed tackles and 59 touches, the highest of any Darmstadt player, guaranteed his worth for his first appearance in the Fantasy team this season. For the first time, Schürrle found himself leading Dortmund's attack on Matchday 17 in the absence of AFCON representative Pierre-Emerick Aubameyang. The ploy paid off for Die Schwarz-Gelben as Schürrle netted his first Bundesliga goal since signing for the club last summer. A single goal was all Mario Gomez needed to secure the Wolves all three points against Hamburger SV. It was the German striker's second Bundesliga goal on the trot and fifth overall in Wolfsburg colours. Scoring goals number 134 and 135, Robert Lewandowski overtook Giovane Elber and moved up to second in the Bundesliga's all-time list of leading foreign goalscorers. The Pole scored bonus points for his brace and his last-gasp winner. Sandro Wagner guided TSG 1899 Hoffenheim to their seventh victory of the season against FC Augsburg. The 29-year-old netted his 10th goal of the campaign to put Julian Nagelsmann's side in front - the fifth time this season he has given his side the lead (a league high).